The fuel reduction program is overseen by the Fuel Reduction Unit within the Tasmania Fire Service, working in cooperation with the Parks and Wildlife Service, Forestry Tasmania, local councils and private land owners. 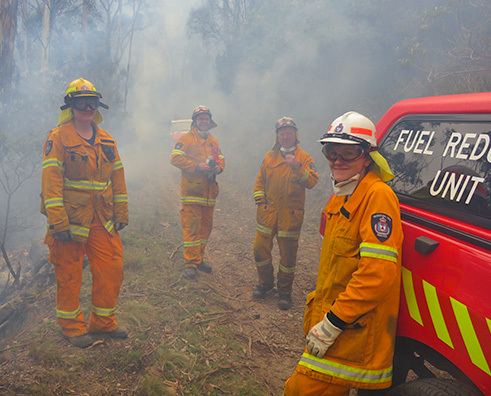 The unit provides a single, coordinated strategic approach to fuel reduction burns in Tasmania, and also manages the program's budget. The program is delivered according to a strict set of priorities: the preservation of life, the protection of critical community infrastructure, residential property, business assets and the natural environment. The unit cooperates with government agencies, interest groups and individual land owners, and makes formal agreements where needed. The Fuel Reduction Unit is also responsible for planning and preparation, consulting and communicating with communities about the fuel reduction program and addressing any concerns. The Unit is divided into Planning, Operations and Community Engagement. There is a regional planner, regional burn coordinator and a community engagement officer in the North and North West and Southern Regions. There is also spatial information analysts, and a Program Coordinator who liaises with the Parks and Wildlife Service. 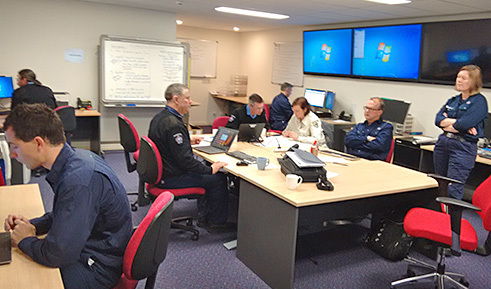 The Fuel Reduction Unit is overseen by a steering committee consisting of senior government department heads, the Tasmania Fire Service's Chief Officer and the Chair of the State Fire Management Council. The steering committee reports to the Minister for Environment, Parks and Heritage. The planning team support the development of fire protection plans, bushfire mitigation plans and operational burning plans. These plans identify important places that are at risk of being impacted by bushfires, and the strategies that can be put in place to reduce the bushfire risk to those communities. We focus on identifying strategies that reduce the rate of spread and intensity of bushfires, and minimise the potential damage cause by bushfires by providing firefighters with safer options. Each year, the planning team conduct bushfire risk modelling and analysis to identify high risk areas in the Tasmanian landscape, and the areas where bushfire risk has been reduced as a result of fuel reduction. Our planners then pass on this information to the fire management area committees, and help them to update their fire protection plans each year. Often, fire protection plans identify broad areas that are considered to be at high risk of being impacted by bushfires, but further work is needed to work out the best strategies for reducing the risk in those areas. In these cases, the planners will develop a bushfire mitigation plan for the area. If fuel reduction burning is required in an area, the planning team will help to prepare a fuel reduction burning plan where private property is involved. These operational burning plans are important to ensure that a burn is conducted in a way that is safe and effective, and takes into consideration the management of special values and issues that have been identified in each area with local landowners. As the fuel reduction program is implemented, planners help to identify areas that are the highest priority for treatment, so that operational staff and firefighters know which burns need to be completed with the resources that are available. During the bushfire season, the planning team provide support for firefighting, by working in planning and intelligence roles including mapping, intelligence gathering, situation analysis and helping to develop objectives & options for incident control. The planning team come with many years of experience in a range of backgrounds from bushfire management, environmental management, sustainability planning and geographic information systems. The Geographic Information Systems team (consisting of a Spatial Analyst and Spatial Information Officer) work inside the planning unit in the FRU. During serious bushfire events, the GIS team is responsible for gathering relevant spatial information about the fire (i.e. fire boundary or properties involved) and displaying this information in map form to the incident management team and for public warnings. The team maintains spatial databases for internal records and uploads relevant information to the TFS website to keep the public informed of upcoming planned burns or where the FRU are currently burning. The team also supports Tasmania's ten Fire Management Area Committee's (FMACs) with maps and data, particularly in the development of the area's Fire Protection Plan (FPP). Running large-scale batch bushfire simulators to help further understand our current risk, and test strategies to further reduce bushfire risk using planned burning. Supporting the operations unit in the productions of operations maps for burn plans and field data collection. Analysing digital terrain models to extract useful features such as tracks or watercourses for the purposes of developing operational burn plans. Furthermore we create maps for portable devices and manage spatial data collected from these devices in the field. The GIS team also help the FRU community engagement section to spatially identify nearby property owners/stakeholders that are relevant for particular burns. We work directly with land-owners and land management agencies to investigate bushfire risk, discuss possible risk reduction methods and collaborate in the development of fuel reduction burn plans. Community information relating to prescribed burning forms a major part of our engagement work. This includes working with those living close to where an upcoming fuel reduction burn is going to be conducted to minimise the disruption caused by the burn. This work can include site meetings, community forums and letter-drops. Broader information covering the whys and wherefores of fuel reduction burning, often as part of community forums or information sessions. These are intended to dispel myths and fears over the use of fire as a risk management technique. Notifications of burn activity, smoke risks, media releases, advertisements in local newspapers, posts on social media, and media events including press conferences and interviews. The Operations staff of the Fuel Reduction Unit carry out the fuel reduction burns. If needed, they can assemble other resources from TFS career and volunteers, the Parks and Wildlife Service, Forestry Tasmania or a contractor workforce. Post-burn monitoring to ensure objectives have been met and to aid continual improvement.